Marisha L. Humphries is an associate professor of Educational Psychology whose research research seeks to develop an integrated approach to studying African American children's normative and prosocial development, and utilizing this basic research to create culturally and developmentally appropriate school-based behavior promotion programs. Her work examines African-American children's emotional and social competence, and the ways in which schools can support children's development in this area. 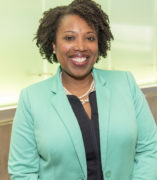 Due to her interest and experience in applied research, Dr. Humphries’ work considers the contextual and cultural factors associated with children, families, and schools. Her research has been published in journals such as the Early Education & Development, Journal of Research on Adolescence, Clinical Child and Family Psychology Review, Journal of the American Academy of Child and Adolescent Psychiatry, Journal of Black Psychology, and Infant Mental Health Journal. Humphries, M. & Iruka, I. (2017). Ring the alarm: Moving from educational gaps to educational opportunities for Black students. In I. U. Iruka, S. Curenton, & T. Durden (eds. ), African American Children in Early Childhood Education: Making the Case for Policy Investments in Families, Schools, and Communities (pp.15-34). United Kingdom: Emerald Group Publishing Limited. Humphries, M. (2016). Social emotional competence: The missing but necessary ingredient in facilitating Black children’s academic outcomes & positive Development. In Black Child Development Institute – Chicago, Being Black is not a risk factor: Statistics and strengths-based solutions in the state of Illinois (pp.30-33). National Black Child Development Institute: Washington, DC. Humphries, M. L., Strickland, J., & Keenan, K. (2014). African American preschoolers’ social and emotional competence at school: Influence of teachers and mothers support. Journal of Education, 194, 11-18.